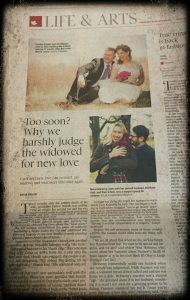 Husband and I were part of an article this week in the Globe And Mail: How Soon is Too Soon? Zosia Bielski, a writer from the Globe, contacted me after reading about The Widower’s Club, and Visiting My Husband’s Wife’s Grave on the blog. She wanted to write about finding love after loss of a spouse that was compassionate and understanding. I emailed her, letting her know that the topic of finding love after relatively recently losing a spouse was something I had much more than a professional opinion on. Finding love “quickly” after a spouse dies is a deeply personal topic for me. I have written often and easily about my relationship with Husband. Husband is compassionate, loving and kind–and makes phenomenal cafe mistos every morning for me. But now Zosia was asking me what his name was, when I generally protect Husband’s identity online. Early on in the interview she asked me exactly how much time passed between Car’s death and our marriage. I’ve never put that fact in my blog. Maybe I didn’t want everyone to know how brief a time it was. Maybe I didn’t want to open myself up to ridicule and judgement. Now, it’s been published online for the whole country to see. Now, it would seem, the whole country knows. She also asked me for a picture of us, on our wedding day. I was chatting with a coach last week. He is a coach of a national level team that is ranked Number 1. The team is racking up enormous numbers of wins and is heading towards another championship. Hopefully. I asked him about the season thus far, and how he felt going into the second half of the season. I wondered about his perceptions of the chances that the team would bring all that championship hardware home. He told me something interesting. The coach said that he knew his team was excelling, but he wasn’t sure that they had what it took to take them down the home stretch. Coach had concern the team hadn’t had to face enough adversity this year. He reflected back on other years where there had been significant challenges with injuries or other difficulties. Facing challenges together creates growth, and enhances a sense of “team”. Overcoming difficulties is one way a team gels, which enhances performance. It is something I’ve mulled about in my head in the days since: A coach appreciating the fruit of a team struggling with hardship. The alchemy of tribulation is important in a team’s success. Hard times make the team stronger, better. As Zosia was writing this article, it seemed she was already imagining layout, including visuals. And she felt a picture of Husband and I would be helpful. She asked for one. It was easy to buy myself some time. I couldn’t say yes to her without Husband also agreeing, of course. I said I’d talk to him and get back to her. It was also a needed opportunity to create space for me to decide if I wanted our picture published in a national newspaper by a writer with whom I’d only had a brief phone conversation. Husband got home a few hours later and I asked him what he thought. He asked me what I thought before he answered–that’s how we roll. We talked about the vulnerability of sending a picture to be used in an article about how harshly people can judge. Sorta seemed like we were setting ourselves up for being skewered by criticism. It’s safer in the background…it invites judgement to have people see us as we share of some tender experiences. Years ago, I attended a weekend called Beginning Experience. It was a hard weekend, full of tears, as I spent three days with people who had also experienced the death of a marriage process the ending of the union. We talked about important loss in significant ways…lots of kleenex were used in the conversations–large and small groups. I like the idea of turning the pain of our lives into something that is palatable…even delicious. 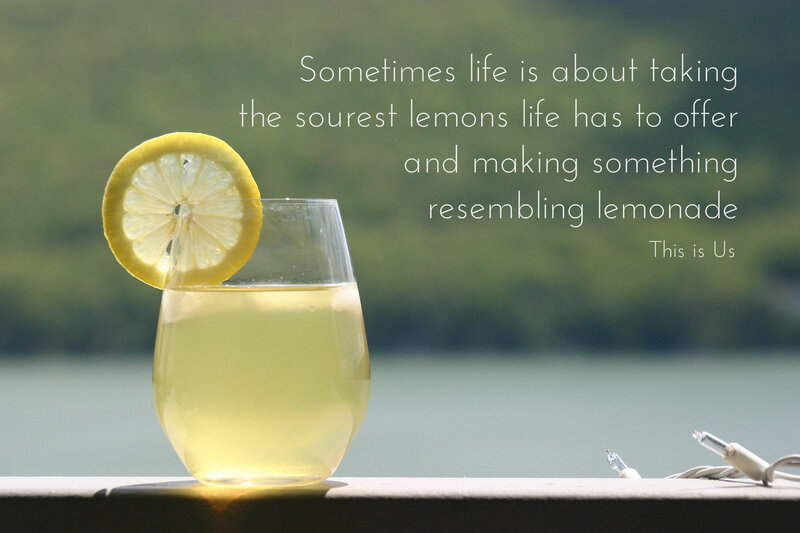 As part of the best glass of lemonade is the cheek-puckering sour taste of the lemons. Going through painful life experiences hurts like heck. Why wouldn’t we want to use every opportunity to turn the painful crap of our lives into something resembling rich compost? Compost provides a nutrient rich medium that enhances growth. We can’t undo the hurt. We can’t stop painful and unfair experiences in lives. We can compost the heartbreak. We can make it into something that doesn’t have to stay ugly and soul destroying–it becomes life giving and redemptive. Turning the pain into something life-giving just seems redemptive. I love the idea of redemption of the inevitable painful and ugly of our lives. It’s our favorite wedding picture. We made a large image of this on canvas and have it hanging in our room. I love it. My favourite part of this picture is what you don’t see. Can’t see. You see, it was a sunny day in April when we posed for these. Apparently, the photographer didn’t think the lighting was right. So he asked our Intermediate Tribe Members** (ITM) to make us shade. And this is all of us, for reals. This is one of my favourite memories of the day. 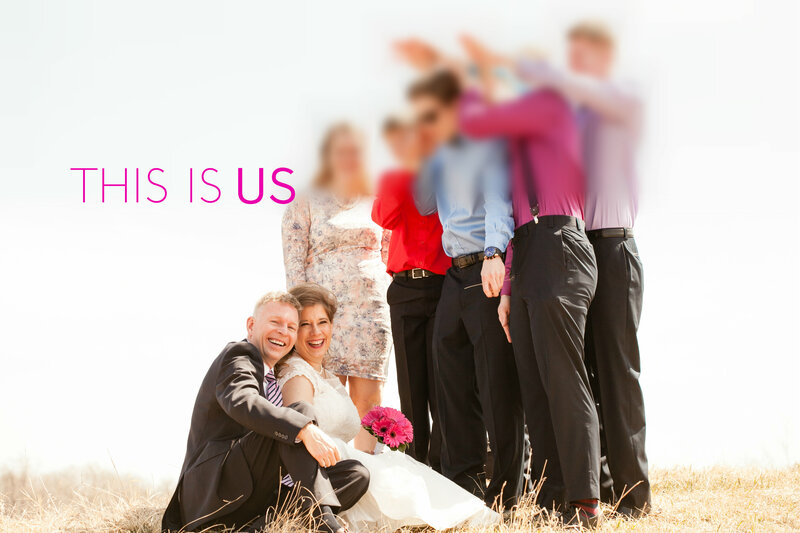 These crazy, fun kids who were doing their darnedest to roll with the strange, beautiful awkward circumstances of their parents marrying each other. We laughed as they sought to create as broad a shade as humanly possible. They worked together as a team…his ITM’s and mine…along a couple extra that have since become our daughter-in-laws. It must have been a hard day in some ways for them, even as they ate yummy cupcakes and played basketball with their buddies. It is a beautiful picture–and an even better memory. It’s something we as parents do for these ITM’s…be there for them, support them, help them and give them a space to escape the worst harshness that life has to offer. And now they were hovering around and above us, giving us what we needed as we celebrated our love in the midst of a wild, hurtful and exquisite life. We do better under the shade of those who love us. We get through the hard times, and turn that heartbreak into beautiful compost when we have the support and love of those who are in our lives. Don’t we all need people to cheer us on, and shield us when the harsh light of our lives gets to be too much? Love and heartbreak recover best, and turn into the most beautiful compost under the conditions love, laughter, and support. 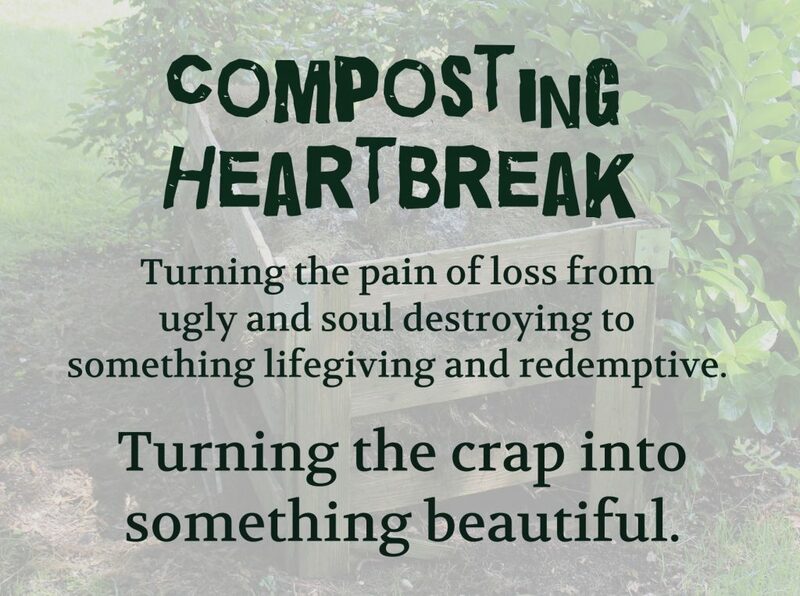 We are in this painful, beautiful journey together…composting heartbreak. **It came out at the family supper table this week, that those formerly known as Junior Tribe Members (JTM’s) are now feeling like they have graduated to be known as Intermediate Tribe Members. 🙂 While they remain our children, they are, in fact, leading adult lives. Gotta love’em. I discovered your blog last week after reading the “How soon is too soon” article online. I’ve spent some time reading your blog – both you and your husband come across as having much wisdom and grace. A beautiful story of hope. The only people whose opinions matter regarding marriage timeframes and those of you, your husband and those close to you.. Strangers on the internet have no right to comment negatively. Your story shows such hope and grace, and that’s a precious thing. Thank you for sharing your story. Thanx, Wilma! What kind and beautiful words. So appreciate you leaving your supportive thoughts. And from New Zealand! How cool! Husband’s late wife made him promise to her, the day before she died, that he take his children to your part of the world as it had always been a dream of his to go. He spent about a week in New Zealand, and just LOVED your part of the world. That is so cool that your husband and children came to NZ – it is a lovely part of the world, although I am a tad biased!